WALTHAM, Mass. -- Former U.S. President Bill Clinton took time to honor the legacy of an old friend Monday at Brandeis University. The 42nd president was invited to give the inaugural lecture for the university’s Eli J. Segal Citizen Leadership Program. He accepted and delivered in memory of the late Eli Segal ’64, who dedicated his life to public service. Segal was Clinton’s chief of staff in his presidential campaign in 1992 and served as an assistant to the President in the White House, working on the administration’s AmeriCorps and Welfare-to-Work programs. In tune with Segal’s career, the program at Brandeis is designed to encourage new leaders to engage in a lifetime of citizen service and serve as a platform to promote community service and citizen leadership. 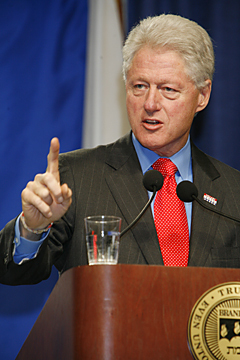 In continuing Segal’s mission, Clinton charged the audience to become “social entrepreneurs” because, he said, “we live in a world where active citizen involvement is required.” He cited inequalities and problems that are concerns worldwide and here in the US - such as poverty, global warming, inadequate health care and poor education. "People come here to be free and develop to their potential," he said. "To continue these inequalities it’s impossible to preserve that ideal." Segal died in 2006 at the age of 63 from mesothelioma, a form of cancer. Following Clinton’s inaugural address there will be a biannual memorial lecture, which will bring additional policy makers, opinion leaders, students, social entrepreneurs, national and community service leaders and members of the Segal Fellows Network to speak at Brandeis. Brandeis president Jehuda Reinharz, who introduced Clinton, also led a question and answer session after the lecture. The crowd was entertained with performances by the Branches Pan Groove Steel Orchestra and by young adults involved in the CityYear program, which is a member of AmeriCorps. For more information about the Eli J. Segal Citizen Leadership Program visit www.segalprogram.org.